Otama Beach is often described as the best beach on the Coromandel Peninsula. Our cabin is elevated on a hill overlooking the beach and is cosy and private. Many of the areas attractions are only a short drive away but when you fall in love with Otama you will not want to go anywhere else. We call it getting Otama'ed and this is actually a phenomenon that happens to many people who stay here. Many say it is the highlight of their holiday and that they feel very relaxed. Facilities in the cabin are minimal, the attraction is the beach and the activities in the area. Its the perfect place to get away from it all, no emails, no texts, no phone calls, no TV and no worries. The cabin is powered by solar power and has a gas powered stove and hot water. There are no power points for charging in the cabin. This cabin is especially suited to a couple but there is a small pull out bed in the lounge. Extra guests by negotiation please. Otama Beach is truly paradise and one of the most beautiful and deserted beaches we've ever encountered in NZ. This Bach is perfect for those who want to be in nature with a staggering view of Otama Beach and love that alternative reality of being on solar power with no distractions from internet and cell phones. Highly recommend it! 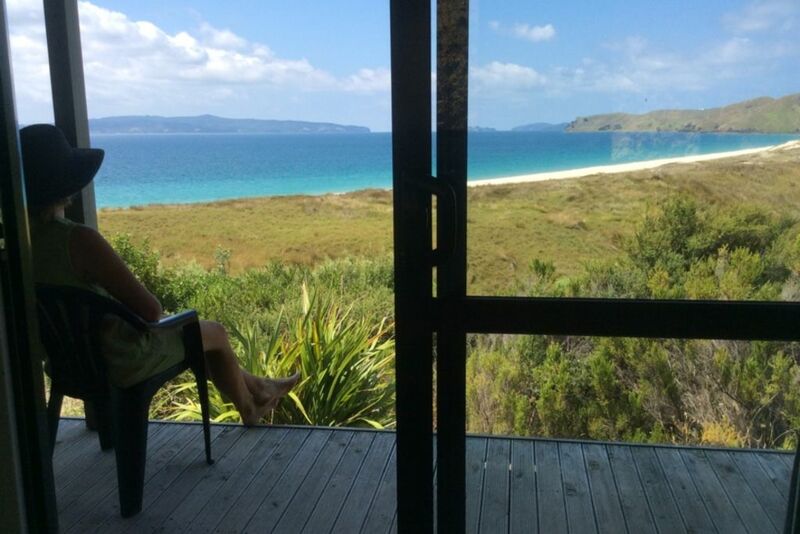 Basic Bach with amazing views of otama beach. The most beautiful beach in nz. There is No power so nowhere to charge your phone up, probably a good thing though. The shower is really strong, and did I say the views are amazing? Would definitely book again. Big enough for two, clean, tidy, comfortable. Great location - quite isolated and private. We had a wondercul experience here. Life slowed down for us...much needed. We loved the view and were entranced by the surreal sunsets. We 'd come again. Thanks, glad you had a relaxing time. Stellar! Can’t wait until next time! Simple accommodation which was clean, had hot water (with excellent shower) and some electricity. Simple accommodation which was clean, had hot water (with excellent shower) and some electricity. It was compact but fine for two people. What makes it special is the stunning location. The view is amazing and with so few people about we had the beach to ourselves a lot of the time. We have never stayed anywhere that has such view, yet the beach was only a couple of minutes away. Otama is the most beautiful beach in the world and I have had the pleasure of visiting this amazing beach all my life. This was our first time staying at this cabin, and although petite in size, it had everything we needed for our short stay, it was clean, tidy and best of all no tv! we will definitely be back again in the future.